API Business Hub turns 1-yr old: Do more with more! SAPPHIRE NOW ’17 is a special milestone for SAP API Business Hub. SAP API Business Hub turns 1-year old. We’ve had a great ride so far helping developers build apps, integrations and innovation easily on the SAP Cloud Platform. Organizations worldwide are embracing digital technologies to become agile, live and intelligent enterprises. APIs are emerging as the digital building blocks for this digital transformation. For SAPPHIRE NOW ’17, we have added more API goodness. APIs covering the whole SAP application portfolio: We now have S4, SuccessFactors, Hybris, Ariba, Concur and Fieldglass APIs in the API Business Hub for easy integration and application development. 60 new SAP S/4 HANA Cloud APIs – ranging from Supplier Invoice, Purchase Order and Production Order management – help developers integrate, innovate and build mobile apps for line-of-business. Industry-specific APIs are making an appearance in API Business Hub with the PSD2 Banking APIs. These APIs offer a simple API Fabric on top of the Banking platform to access basic account information and transactions in a simplified manner. Business Services APIs allow developers to access enterprise business capabilities such as taxation, translation, data quality, machine learning and text analysis through simple APIs. SAP Leonardo Machine Learning, HANA Text Analysis, Translation Hub, Tax-as-a-service are new business services in the API Business Hub. See them here. For developers, by developers our mission is to make developers super heroes. Explore the interactive documentation, test the APIs in an out-of-the-box API Sandbox, use your WebIDE to discover, test and consume APIs from the API Business Hub, generate code in 5 languages (including ABAP). 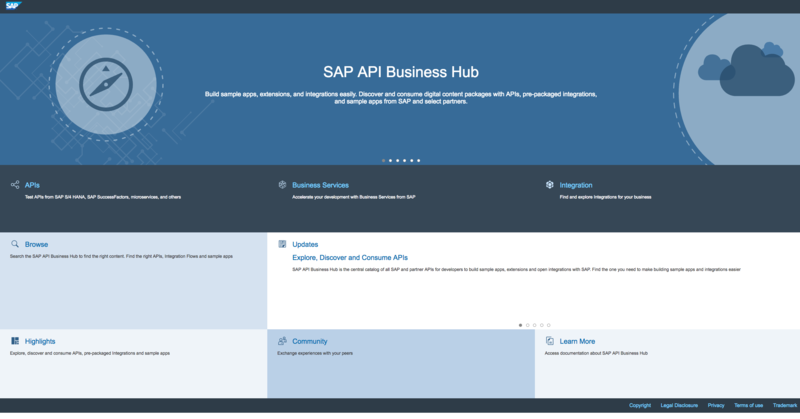 See the blog on how to build Fiori Apps with WebIDE using API Business Hub. Accelerate your integration with out-of-the-box integration packages, adapters that can be readily consumed in SAP Cloud Platform Integration. Citizen integrators benefit from SuccessFactors Integration Center packages. Simplified digital consumption of these digital building blocks like APIs, integration packages and code snippets help you to discover – tryout – subscribe – consume and receive update notifications all through an in-app experience. This was just an appetizer of the rich set of content that’s available on the SAP API Business Hub. Sample the full course yourselves at api.sap.com, and come back for more! We will continuously add high-quality, differentiating digital content to the SAP API Business Hub – from application services to integration to business services – SAP Industry Cloud, SAP Business Objects Cloud are just a few examples of the APIs that are lined up to be published in the next few weeks. (That’s why it’s a good idea to stop by regularly at api.sap.com). And we will continue to make it easier and fun for hard-core and citizen developers alike to access and productively use our APIs from the SAP API Business Hub.